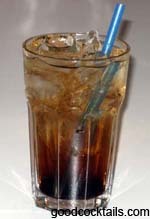 Pour vodka and coffee liqueur into a glass with ice. Fill it with soda water. Do not stir or shake. You should drink it in one shot with a straw.